This year's AGM will start half-an-hour before the Spring Public meeting. All positions will become vacant. We always need volunteers. If you wish to nominate for any position please send an email to our Public Officer (me) or nominate at the meeting. Robyn Coghlan (Chair), Darryl Seto (Minutes), Carol Finlayson, Doug Finlayson, Ian Trapnell, Rosemary Blemings, Russ Temple, David Wong, David Kelly, Brian Rhynehart, Chris Watson, Luis Terran, Jean Geue. Acceptance of the minutes: Proposed Darryl Seto, seconded Doug Finlayson. Accepted. Busy year with ACT Consultations, eg, Nature in our City, Electricity transmission lines in the Ginninderry and several development applications. Parkwood development. Current status is conditional on a Bush Fire Plan. We had a display at the Traders Club for a month and ran stalls at Yass, Murrumbateman and Hall Markets. Thanks to Darryl and Rosemary for the bulk of the work here. GFA paid for a preliminary study of bushfire risk in the area using money raised in a Chuffed online campaign. Ginninderry Stage 1: Our appeal to ACAT was settled by negotiation. Thanks to Environmental Defenders Office – Camilla Taylor, Bruce, Steph Booker and Nicola Silbert – (motion by Darryl Seto, seconded Chris Watson: Accepted) and Ian Trapnell for his design work for new GFA presentations (motion by Carol Finlayson, seconded Chris Watson: Accepted). Summary: We went from $2560 at the end of last financial year to only $850 this year but this year we had exceptionally high expenditures. Special thanks to members who carried many costs and to those who made donations – some quite substantial. Thanks also to John Wells who once again audited our statement gratis. Robyn vacated the chair for Darryl (Public Officer) who declared all positions vacant. Our first Patron, Dr Bryan Pratt, died the previous Friday. Darryl noted that Dr Pratt was heavily involved in the working party set up by the Belconnen Community Council to look into cross-border issues at West Belconnen. Prompted by Dr Pratt, the working party recommended the establishment of the Murrumbidgee - Ginninderra Gorges National Park. A vote of thanks for all his work was passed – proposed by Robyn Coghlan and seconded by Chris Watson. There being no further business the meeting was closed at 6:40pm. This has been a busy year, culminating in the ACT Government’s community consultation initiative with numerous major inquiries on issues relevant to this association. Submissions were lodged to the Planning Inquiry into Nature in our City and to several development applications, one involving a new electricity substation and extension of the electricity transmission lines in the Ginninderry vicinity. Over recent years, the Ginninderra Falls Association and Ginninderra Catchment Group have met with Ginninderry in the Ginninderra Falls Working Group to discuss common issues. The last meeting was held on 5 Jul 2017 on the ground that the Parkwood part of the proposal was in the process of being resubmitted to Yass Valley Council. 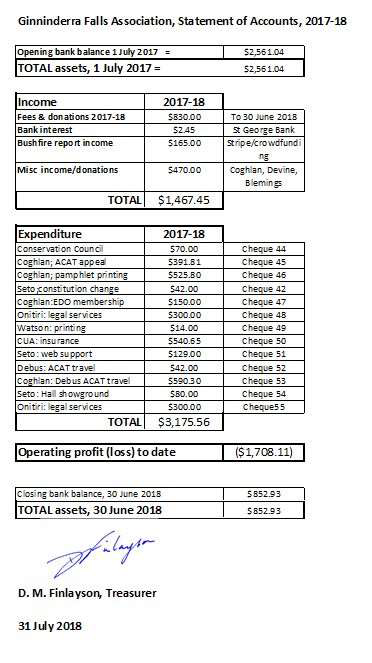 That month, GFA paid for a preliminary study of bushfire risk in the area using money raised in a Chuffed online campaign. At the AGM on 3 August, Jason Sharples gave the first of his fire talks for GFA. At this AGM, approval was given to changes to the objects of the Association designed to clarify the intent in the constitution. In August, the decision to approve the Development Application for Ginninderry Stage 1 was received. GFA had made a submission questioning the lodgment of this DA in the Merit Track. This meant that the DA did not have to comply fully with the planning rules nor did it require an Environmental Impact Statement (EIS). Given the location of Stage 1 only 200 metres from a known Little Eagle nesting tree, GFA considered an EIS was mandatory. In concern that this would set a precedent for future stages in the Ginninderry project, GFA appealed the decision to the ACT Civil and Administrative Appeals Tribunal. After failed mediation at the Tribunal and a further hearing in which GFA’s standing to appeal was examined and approved, a negotiated settlement was reached on 8 Feb 2018. In this settlement, Ginninderry committed to a series of measures to be undertaken in Stages 8 and 10 which will be near the nesting tree. GFA then withdrew its appeal. Immediately thereafter, Ginninderry applied to the ACT Planning Minister for EIS exemption on all future stages in the ACT section to be valid for fifty years. GFA lodged an objection to this application with the assistance of the Environmental Defenders Office (EDO). A decision is still awaited. During September and October, GFA had a display at Trader & Co in Yass highlighting the history and ecology of the area and concerns about urban development. Discussions were held with Ed Wensing about a possible meeting with aboriginal groups with a particular focus on intangible heritage. At the YVC meeting on 25 Oct 2017, GFA made a presentation to the Council but councillors agreed unanimously to forward the Parkwood proposal to the NSW Government for assessment. Throughout January to the end of May, a GFA stall was held at the Yass, Murrumbateman and Hall markets to publicise the Parkwood proposal. This involved two to three GFA members devoting much of the day to travel, setting up and manning the stall to inform local residents of the urban plan and associated issues. Two petitions were raised, one for NSW residents and one for ACT residents. Throughout the year, GFA has liaised with other groups with common interests, such as the Ginninderra Catchment Group, contributing to a discussion group on the Kippax Master Plan on 22 Feb 2018, attending the Nature Conservation Council conference on 26 May, meeting with Kate Auty, ACT Commissioner for Sustainability and Environment, on 20 March and participating in a meeting and tour of the Ginninderra Falls area with the President of the National Parks Association of NSW on 26 June. GFA was also contacted by the RU6 Group of NSW residents adjacent to the ACT who were concerned about a Yass Valley proposal to exclude urban densification in a five-kilometre area along the border but exempting the Parkwood extension of Ginninderry. A vote of thanks is needed to the Environmental Defenders Office for their continuing support and input; to Camilla Taylor and Bruce Chalmers for their help in 2017 and to Steph Booker and Nicola Silbert in 2018. Others who provided much-needed assistance include Seyi Onitiri (barrister), Geoffrey Dabb (Canberra Ornithologists Group) and Stephen Debus and Jerry Olsen (ornithologists). Lastly, we are delighted to welcome to our group, Ian Trapnell, who has offered his graphic design skills to promote GFA concerns. 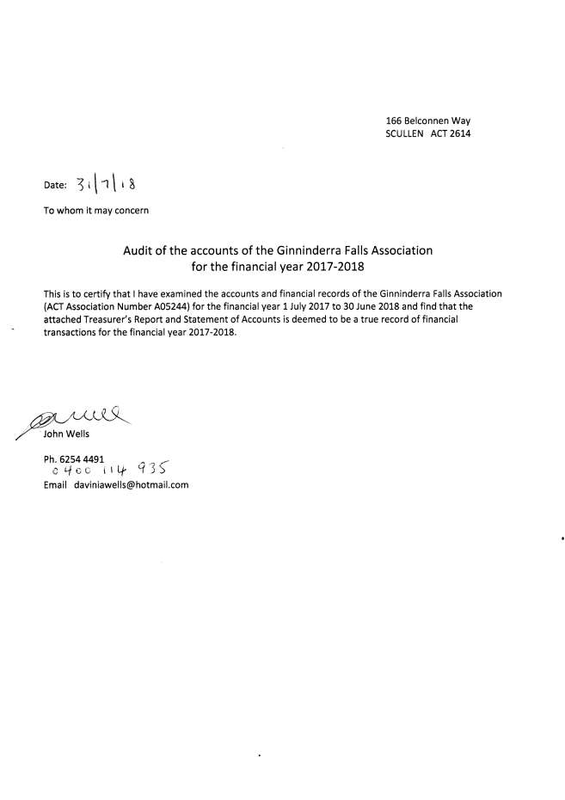 The constitution of the Ginninderra Falls Association stipulates that the Association financial year ends on 30 June each year. This report sets out the accounts of the Association for the period 1 July 2017 to 30 June 2018. The income during the financial year was derived mostly from members’ fees and a few donations. The number of financial members during the 2017-18 financial year was 20, very disappointing but not unexpected. A statement of accounts is attached. The Association bank cheque account exists with the St George Bank (BSB 112-908; Account number 447 299 504) with five signatories (President, Vice-President, Secretary, Treasurer, Public Officer), any one of whom may singly operate the account. A receipt book, cheque book and a computer file of bank statements document the Association income. A record is kept of all Association supporters, whether or not they are financial members. The statement of accounts for the financial year 2017 to 2018 is attached. The Association chooses to be a member of the Conservation Council of the ACT along with other like- minded associations; there is a membership fee. The Ginninderra Falls Association is obliged to have public liability insurance if it wishes to apply for grants and conduct meetings and excursions. This is a significant cost for the Association. The Association maintains a web site that incurs commercial administration and running costs. The membership fee for the financial year 2017-2018 was $35 and it is recommended this fee be retained for 2018-19 (no family membership). Those supporters dependent solely on an aged/disability/study/unemployment Government income may seek membership fee relief from the Association Treasurer (entirely in confidence). The small number of financial members during 2017-2018 is a cause for concern. Individuals, including committee members, who have absorbed costs connected with the operations and administration of the Association and the promotion of the Association in the public domain. The Association wishes specially to thank those individuals who have made donations to the Association. John Wells, for auditing the Association accounts (Former bank branch manager, bookkeeper Kippax Veterinary Hospital).